"PandaDoc is a web-based digital document management platform." PandaDoc provides organizations complete digital document solution. Its users are able to create, send, sign, and track documents online, as well as to securely process paperless transactions. The service is aimed at sales teams in SMEs and large enterprises. Documents, that can be handled by this platform are proposals, quotes, contracts, HR documents, receipts, invoices, etc. PandaDoc offers set of templates and preset text blocks that makes quoting easy and fast. It streamlines the way sales teams creates and sends sales papers, making closing deals more effective. It is possible to share documents within the organization's departments, or defined groups of people. PandaDoc also features CPQ functionality, pricing tables, e-signatures, proposal generation, image library, and more. PandaDoc scored 89/100 in the Proposal Management category. This is based on user satisfaction (88/100), press buzz (45/100), recent user trends (rising), and other relevant information on PandaDoc gathered from around the web. PandaDoc is a web-based document automation Software as a Service (SaaS) designed to help marketing and management teams increase productivity and sales. The system allows users to design, deliver, share, and track documents online from one central dashboard. With its built-in electronic signature feature, PandaDoc makes it easy and convenient for users and clients to sign documents from any device. The software product helps boost the proposal win rates of small, medium-sized, and large businesses and organizations. It also meets the need of human resource departments with its customizable workflows and other useful features. 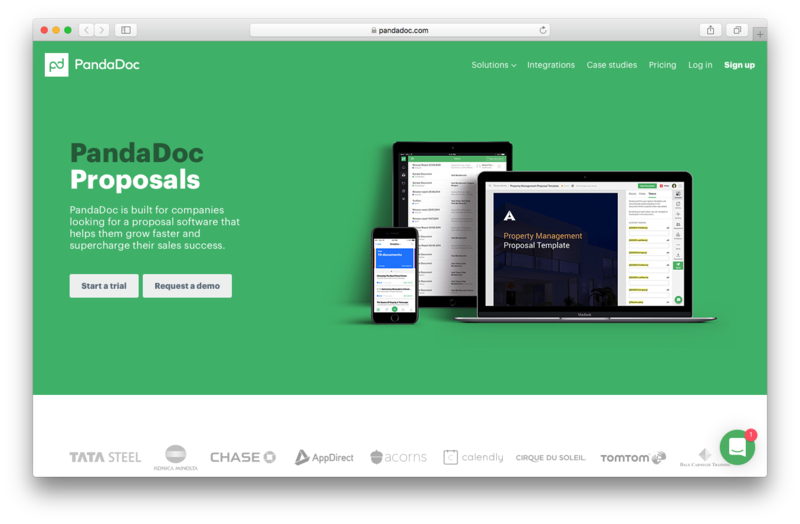 PandaDoc is designed to help users quickly create custom-made, media-rich proposals. It also provides the tools necessary for an effective and successful sales cycle. Features of the software include proposals and quotes, team, and content management. The system also provides users with capabilities for branding and design, tracking, and workflow management. The software allows you to manage and access all documents with a few clicks. It also comes with an intelligent analytical feature that enables you to study your market and come up with more effective marketing proposals. It takes a lot of time and creativity to come up with the best proposal, deliver these to potential clients, and have the agreements signed. PandaDoc provides a solution to these wearisome tasks using one simple but robust platform. The software gives users access to templates that enable them to easily develop the designs they want. The system utilizes electronic signature technology, which means no more waste of time and paper. Through the software, documents can be signed anytime and anywhere. The system provides options to users to change the language and currency in documents to suit regional standards. With this software solution, HR executives, managers, and training managers are also able to create, complete, and file important human resource documents. PandaDoc has a hiring package, which ends the time-consuming administrative work of the HR management. The software has Android and iOS mobile applications, making it more convenient for users and clients to do business from anywhere, anytime. PandaDoc also comes with a bevy of features like pricing tables, email and other external integrations, file transfer, expense tracking, file sharing, Google apps integration, password and access management, order management, and Configure, Price, Quote (CPQ) functionality. Users are able to create customized business documents that reflect their brand. The software provides templates for proposals, quotes, receipts, invoices, business plans, and agreements. The software enables you to increase document accuracy and merge customer relationship management (CRM) data with your documents. PandaDoc provides users with a secure cloud central repository where all documents and files are kept. This allows users to access the documents they need at any given time. The PandaDoc electronic signature feature eliminates the hassles of forwarding, reviewing, and signing documents using different tools. It allows users to save a lot of time and money by streamlining sales, onboarding, and training with e-signatures. The electronic signature functionality is free and unlimited. The software provides necessary collaboration tools to help users complete the sales process in less time. Its template and content libraries enable you to come up with attractive proposals and reduce close time. It also has an in-proposal activity logging and commenting feature to make collaboration easy. This feature provides a public and private comment and feedback system. The software boosts accuracy, efficiency, and productivity. 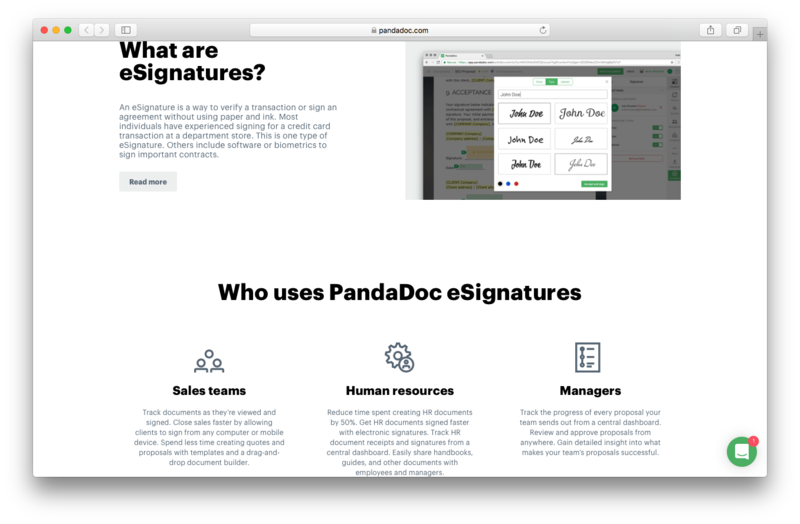 PandaDoc offers built-in e-signatures and payment processing in one package. Aside from streamlining the process of creating proposals and closing sales, the system helps human resource managers create documents for new hires or track training documents. All these can be accessed online using mobile phones or computers. With its robust features, PandaDoc helps users close deals fast and easy. PandaDoc enables users to track documents sent to clients. It comes with real-time analytics, which helps users know when the recipient opens and completes the documents. The software provides information on who viewed each proposal and how much time is spent on each section and page. Such detailed analytics enable users to understand their market and to adjust proposals to suit client’s needs or preferences. Through the system, sales teams are able to come up with modified proposals for better sales and productivity. PandaDoc was built to seamlessly integrate with top business tools for Customer Relations Management (CRM), marketing, accounting, help desk, cloud storage, accounting, and other solutions. The software connects with SugarCRM, ProsperWorks CRM, SalesforceIQ, Xero, Base CRM, Insightly, Pipedrive, Zendesk, Box, Dropbox, Stripe, Zoho CRM, Nimble, Capsule, HubSpot CRM, Salesforce Sales Cloud, Microsoft Dynamics CRM, Close.io, and Nutshell CRM. PandaDoc also supports PDFs and other digital documents. The software keeps your documents safe and secure in the cloud. It is built with the same security encryption used by financial institutions and enterprises. The PandaDoc security is parallel with industry standards. It has a Service Organization Controls (SOC) 2 Type 1 certification. PandaDoc comes with a strong global support team. Users are able to avail of technical help for the software application programming interface, integrations, and core product through webinars, emails, live chat, and phone support. PandaDoc offers three pricing plans for companies of different sizes. Subscription is paid annually. The software provides a 14-day free trial period and free demos. PandaDoc is a complete digital solution that helps users manage organizational documents and shorten the sales cycle of businesses. The software simplifies the sales process from beginning to end. It is easy to use and has all the features to help businesses increase efficiency and revenue. If you want to streamline your sales process and have better results, PandaDoc is a software solution you should consider. Product recommendations, vendor rankings, market overview and tips on how to select Proposal Management software for business. Published in April 2019. Does PandaDoc offer an API? Does PandaDoc offer guides, tutorials and or customer support? Support offered: Help Center, Webinars, FAQs, Phone Support, Video Tutorials. Who are the main user groups of PandaDoc? Main users of PandaDoc are SMEs and large enterprises. Does PandaDoc integrate with any other apps? Yes, it integrates with: Xero, SugarCRM, Zendesk, Base CRM, Zoho CRM, Dropbox, Capsule, Nimble, Microsoft Dynamics CRM, Salesforce Sales Cloud, Pipedrive, Insightly, Box, Stripe, Nutshell CRM, Close.io, SalesforceIQ, ProsperWorks CRM, HubSpot CRM. Does PandaDoc offer multi-user capability (e.g. teams)? What are some applications PandaDoc is commonly used in tandem with? This service is commonly used in tandem with CRM applications. What platforms does PandaDoc support? This is a web-based platform with Android and iOS mobile apps. What is PandaDoc generally used for? This is a complete digital document solution. 4.41/5 based on 408 user ratings. Jul 22, 2018 jacod michael smith williams // Supervisor of Operations at INVENSENSE ITALY S.R.L. What do you like about PandaDoc? Pandadoc saves a lot of time in the process of creating documents. It also eliminates the manual task of e-mailing a document for review and approval. PandaDoc is an incredible solution for organizations of any size. I like this product a lot because of how safe it is to use it; generating great confidence for us and for our customers. I'm happy with the quality of this product and how comfortable it is to sign documents ... no matter the size of the company, this product is ideal to streamline all types of business processes .... It adapts to all companies, it's reliable ... it's simply the best. What do you dislike about PandaDoc? I do not like that emails are not generated from my commercial email, so there is the possibility that a person with a sensitive email filter can access the SPAM folder. What have you been using it for and what problems did PandaDoc solve? I definitely recommend this product. Exceeds all expectations. However, before starting to use PandaDoc, check its compatibility with the product. Your performance will improve if there are more links with the tool. Also, keep in mind that if there are formatting problems or technical errors, the PandaDoc team support is very good.